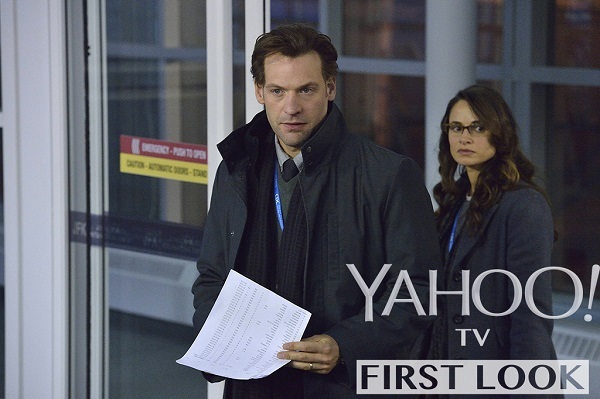 I believe we can say beyond a shadow of a doubt that what people have been looking forward to the most from FX’s upcoming horror series The Strain is seeing what the show would do with Corey Stoll’s hair. And boy are we not disappointed, as our first look at the series includes a great shot of Stoll with some of the most Michael Douglassy type hairdos this side of Fatal Attraction. I suppose it’s more important that we’re even getting a first look at the show, but hair is everything on FX. Also, there isn’t much going on in that picture, as Dr. Ephraim Goodweather (Stoll) is exiting a hospital with Dr. Nora Martinez (Mia Maestro). Goodweather is the head of a rapid-response team from the Center for Disease Control sent to handle what is assumedly an easy to contain biological threat, but is in fact a vampiric virus that has taken over New York City. Talk about lowered expectations. 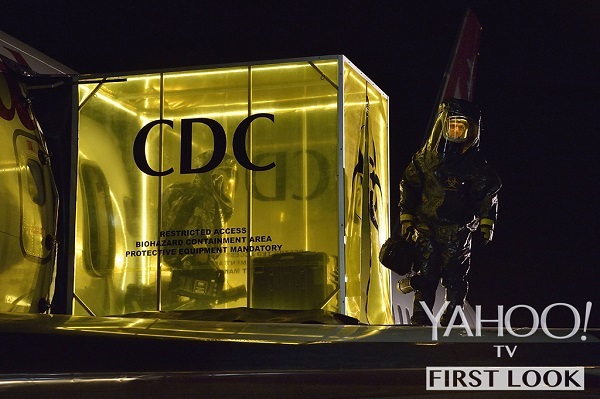 In fact, here’s a shot of a CDC tent (also via Yahoo), with an unrecognizable person in a suit walking out. Admittedly, it looks less like a quarantined hub and more like a cologne container. The Strain will also center on a former professor and Holocaust survivor named Abraham Setrakian (David Bradley), whose position at a pawnshop in Spanish Harlem belies the information that he knows about the bloodthirsty outbreak occurring. He joins Goodweather in the battle for humanity in trying to contain the contagion. The cast also includes Kevin Durand, Sean Astin, Robert Maillet, Regina King, Natalie Brown, Richard Sammel, Miguel Gomez, Jonathan Hyde and Ben Hyland, among others. Based on the bestselling novel trilogy by novelist Chuck Hogan and director Guillermo del Toro, The Strain is set for a 13-episode season that will air on FX this July. Even if it wasn’t a grittier look at a vampire genre that has gotten pretty soft in the years following Twilight, I would still be rabid for this show to prove that it was worth del Toro delaying the filming of his upcoming gothic horror Crimson Peak. Check out the first rat-filled viral promotion the series released last month. He is definitely coming.